all it takes is a song to remind us. Over the past eight years, Atlanta-based Casting Crowns has consistently delivered music that points believers back to what truly matters, and the band does so yet again on “Come to the Well.” Casting Crowns continues to deliver passionate, thought provoking music; yet, these songs are among the most intensely personal offerings the group has ever shared. Remembering that simple, but powerful truth has served Hall and his bandmates (Megan Garrett, Melodee DeVevo, Hector Cervantes, Chris Huffman, Juan DeVevo and Brian Scoggin) well, particularly over the last few years as they’ve juggled faith, family, music and ministry. Even as Casting Crowns has become Christian music’s most successful act, Hall and his fellow band members have continued working at their home churches. Hall has remained a youth pastor at Eagles Landing Baptist Church, even as the band’s music ministry has gained global acclaim. came from,” Hall says of the inspiration for the new album. “Your friends aren’t the well. They aren’t always going to do the right thing or be there for you. You draw from Jesus. You pour into your friends. Your scholarship can’t be the well. If your knee goes out, your well is dry. You need to draw from Jesus, pour into that. It became such a theme for everything that I have been teaching. Your walk with Jesus is where it all starts. It’s where it all comes from. That is where it started with the idea of Jesus being the well versus other things. I knew before any other songs were written that this album had to be called ‘Come to the Well,’ because that’s the central theme of everything we’re going to talk about in the next two years.” In addition to the new album, Hall has also authored a new book titled, ‘The Well: Why Are So Many Still Thirsty?’ “It’s the story of the woman at the well and when she first meets Jesus,” Hall explains. Jesus says: ‘If you knew who you were talking to, you would ask me and I’d give you living water.’ She’s like, ‘what kind of water is this that you’re speaking of?’ In other words, I’ve got my water that I’m talking about. You’ve got your water you’re talking about. A Modern Day Knight’ by Robert Lewis, and it’s all about manhood,” says Hall. “When I look around I see people who are passionate about the things that don’t matter and passive about the things that matter most. We’re like followers instead of leaders. Somewhere along the line the warriors have become watchers. I started challenging guys in my youth group and now I’ve got high school guys who are discipling the middle school guys once a week because they are realizing there needs to be more to me than just weight lifting.” ‘Jesus, Friend of Sinners’ urges open-hearted compassion while ‘Already There’ is a potent treatise on God’s faithfulness. ‘Spirit Wind’ is one of the first songs Hall ever wrote, and has long been one of his father’s favorites. The song has a blue-grassy flavor unlike anything Casting Crowns has ever done. On the other end of the musical spectrum, ‘My Own Worst Enemy’ is an all-out rocker about not falling back into past behavior. Hall, who has won two ‘Songwriter of the Year’ GMA Dove Awards, collaborated with some old friends in writing for the new record, and also made some new ones. He and Steven Curtis Chapman penned ‘So Far to Find You’ about Mark’s adopted daughter Hope. Hall also wrote for the first time with Tom Douglas, an award winning country songwriter who has penned numerous hits, including Miranda Lambert’s ‘The House That Built Me’, Tim McGraw’s ‘Grown Men Don’t Cry’, and Lady Antebellum’s ‘I Run to You’. Hall was working on ‘Just Another Birthday’ and was looking to get another writer’s input. Miller offered to introduce him to Douglas. “He said, ‘Tom lives across the street from me so why don’t you get with him,’” Hall says. Hall enjoys the collaborative process. “I like writing with others. It kind of gets you out of your comfort zone,” he notes. Since its launch in 2003 the band has garnered 14 GMA Dove Awards, three GRAMMY Awards, two Billboard Music Awards and an American Music Award. In addition, the band has seen three RIAA Platinum Albums (Casting Crowns, Lifesong, Altar and The Door), two RIAA Platinum DVDs (Live From Atlanta and Lifesong Live), five RIAA Gold Albums (Casting Crowns, Lifesong, The Altar and the Door, Until the Whole World Hears, Peace on Earth) and two Gold DVDs (Altar and The Door Live and Until The Whole World Hears Live). Casting Crowns has sold more than 8.2 million albums to date (according to Nielsen SoundScan) and has been named Billboard magazine’s top-selling Christian act for the past four years. In This Storm’ have also been certified for selling more than 500,000 copies. 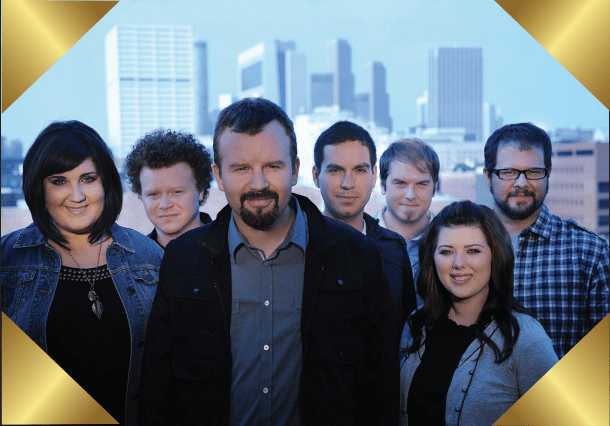 Casting Crowns has always worked its tour schedule around church responsibilities, and has still managed to touch audiences around the world with its live performances. Its 2011-2012 ‘Come to the Well’ 82-city tour sold out in 40 venues. The band has previously performed twice in North Korea in partnership with Global Resource Services and for the U.S. troops in Kuwait and Qatar.